Our mission is to raise healthy animals according to how nature designed. We do this by ensuring animals have fresh pasture on a regular basis and supplement with free-choice vitamins and minerals. Our healthy soil, free from herbicides and pesticides, creates healthy animals, which in turn provides optimum nutrition in our beef and eggs. We believe when we improve the land through sustainable, rotational grazing, we improve the overall health of everyone involved. 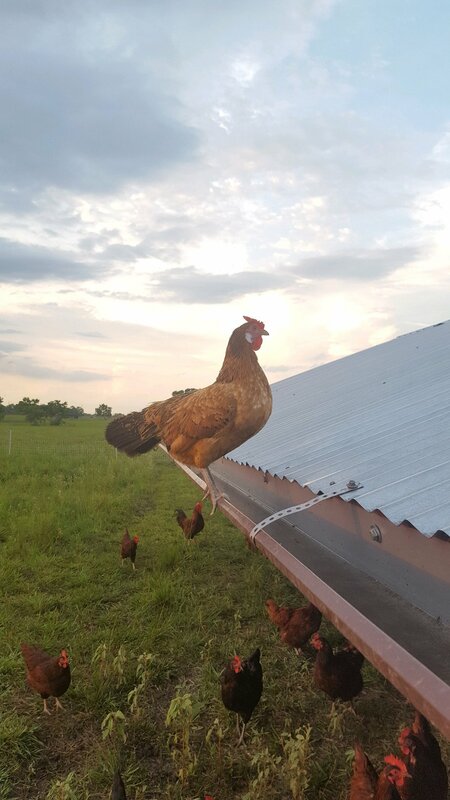 Chickens live 100% on pasture and have access to fresh grass and water every day. We practice rotational grazing, so chickens are moved to new pasture every 3-5 days. This ensures they have fresh sunshine, grass, and bugs every day which leads to a dark yellow yolk that can't be beat! Our chicken's natural foraging is supplemented with a Corn & Soy free / non-GMO feed to ensure each and every egg is as nutritious as possible. Our beef is raised 100% on natural pasture and are not given grain, steroids, or antibiotics. We have also not used pesticides or herbicides on the pasture, ensuring we provide the best beef around. Grass-fed beef is naturally lower in fat as they haven't been given grain in the last 3-4 months to 'fatten' them up. While this can lead to less marbling, the flavor is outstanding. and the Delivery Options to order.